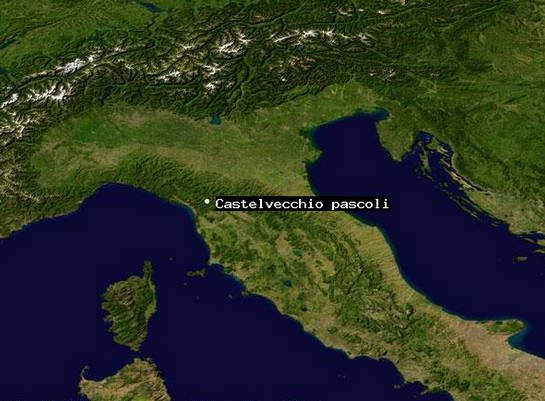 CASTELVECCHIO PASCOLI is not only the motherland of the Quilietti family but also of her other families, the Conti and Brucciani families being the two closest to our own name. Then Giovanelli, Brogi and Tortelli. 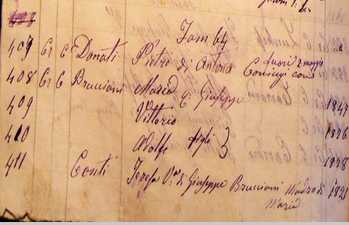 These families are the names of our ancestors and they are all documented in the little Church of St. Nicolo’ which was built in 1638 and whose records are still available to search in the same Church some 400 years later. Castelvecchio at the Turn of the 20th century from the road looking up to San Nicolo"
Castelvecchio was the name of the village for hundreds of years. 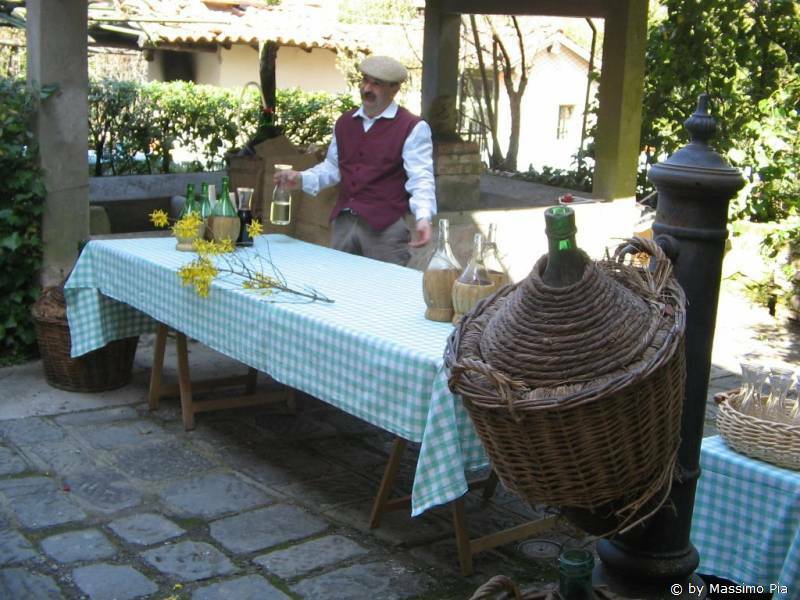 It was only in 1900 that the village was named after the famous Italian Poet Pascoli. THE RESTORATION OF THE PARISH CHURCH OF CASTELVECCHIO PASCOLI. 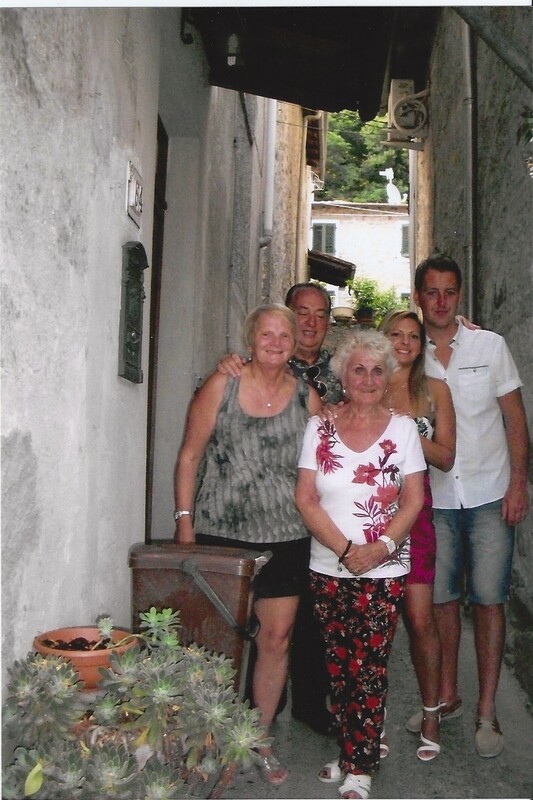 CASTELVECCHIO PASCOLI – our own family the Quilietti family lived at House Number 64 in the village. 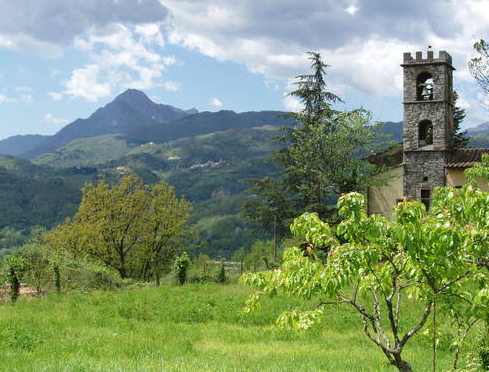 The surburb of Castelvecchio is formed from two villages, Castelveccho of above and Castelvecchio of under, the first one, the most ancient was also known as Caproni from the name of an ancient present family who had resided here from the Sixteenth Century. According to local historians it came in place during the Roman occupations. 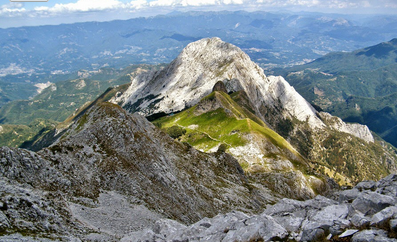 The Roman place of Cascio Balbo was found in documents from the year 994. When the place reappeared some centuries lated it was quoted with hte name Castelvecchio. So Castelvecchio is made up of two seperate parts, Castelvecchio di Sopra or Caprona and Castelvecchio di Sotto. 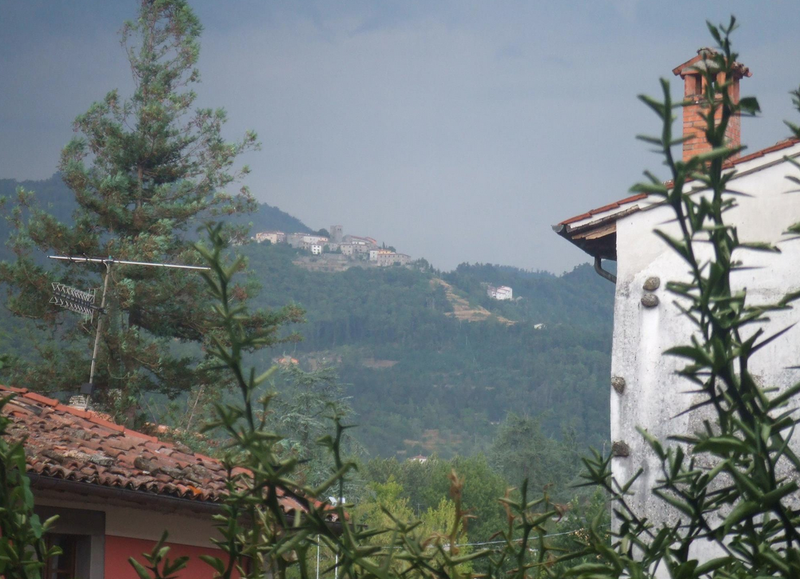 The heart of any Italian village is of course the Church and this village is no exception. 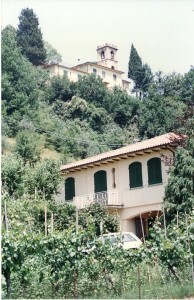 The Church of Saint Nicolo’ lies high above the main road which runs through the town. 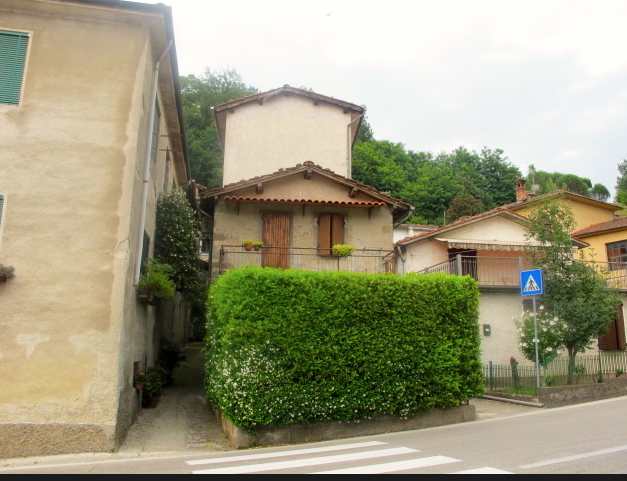 This little Church has baptised not only the Quilietti children but also many of her maternal family, Conti, Brucciani, Rocchi, Gargaro, Donati, Dante, and many more familiar names connected in one way or another to our family. 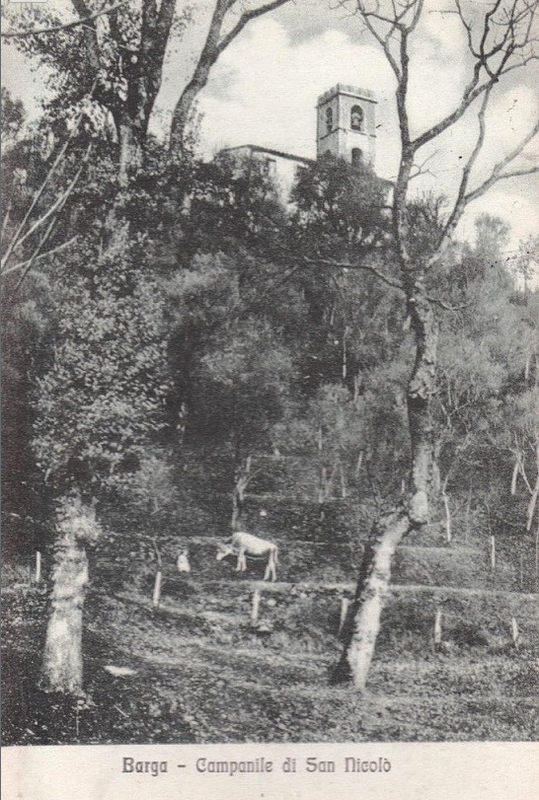 To find this Church you have to climb up the hill and steer left until you can go no further. Here you will find the Pascoli Museum. Go through an entrance to the right of this and make your way along a winding path which has a steep drop to the right with a wee burn running down the slopes. You continue along past the old Bakehouse, where all the villagers would have baked their pani in times gone by. It is a very nostalgic feeling here as our own ancestors would have most certainly stood at this very place 150 years ago. Family 3 showing Leonardo, Eletta, Emilio, Augusto, Ermenia, Maria Domenica and Giuseppe. 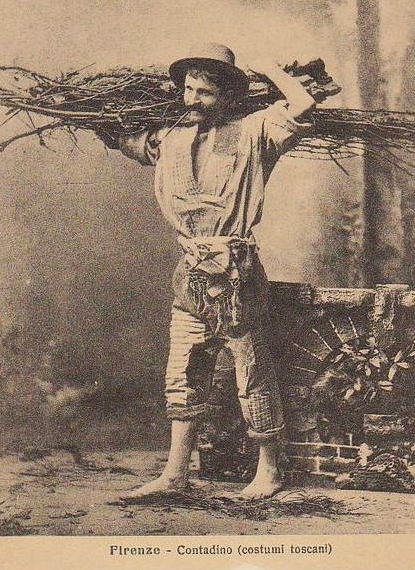 Adolfo was still to come in this 1880 example. 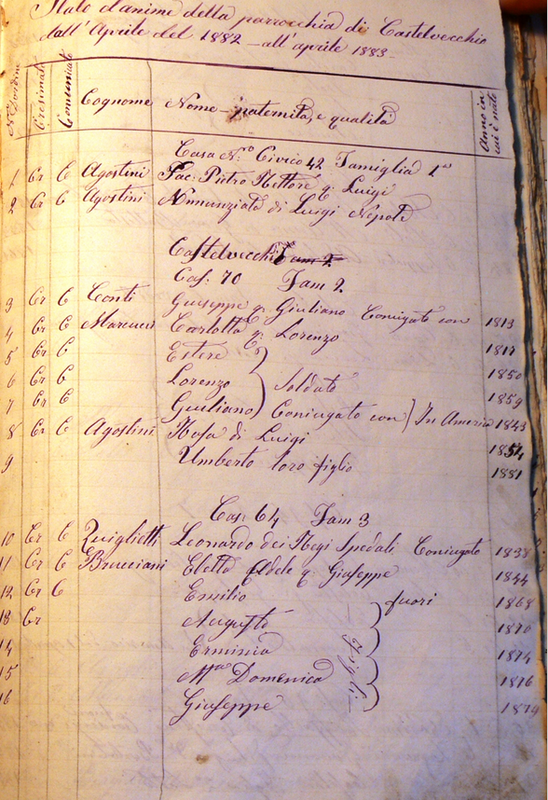 From the 1879 census. 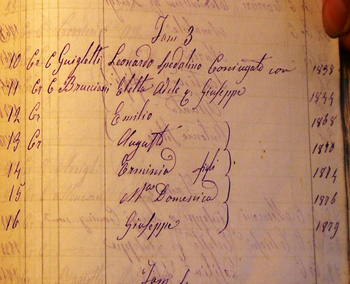 Eletta's sister Maria Anna and her husband Francesco Dante.. Their children are also documented. Pietro married his cousin Ermenia Quilietti in 1899 in Rhode Island. From 1881 the Family 64 in Caproni. Pietro Donati and Maria Brucciani. . Teresa Conti, the Brucciani girls mum is also here. 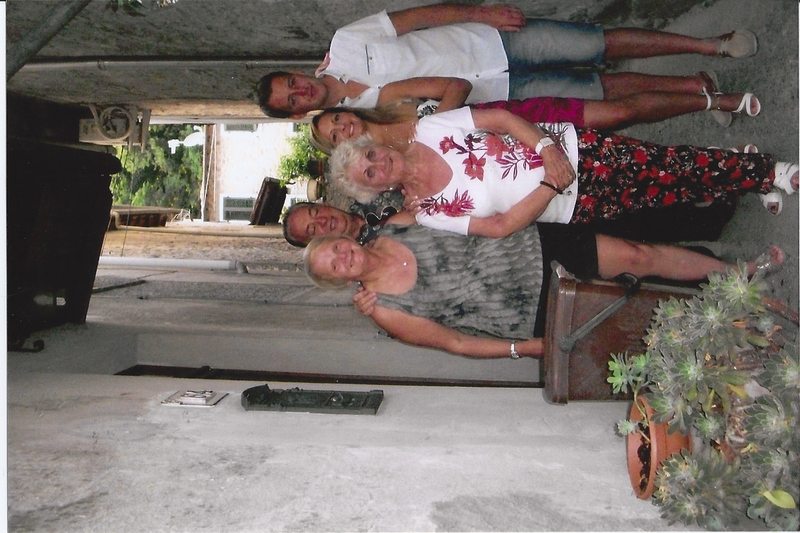 This family came to Scotland and the Quilietti boys followed. 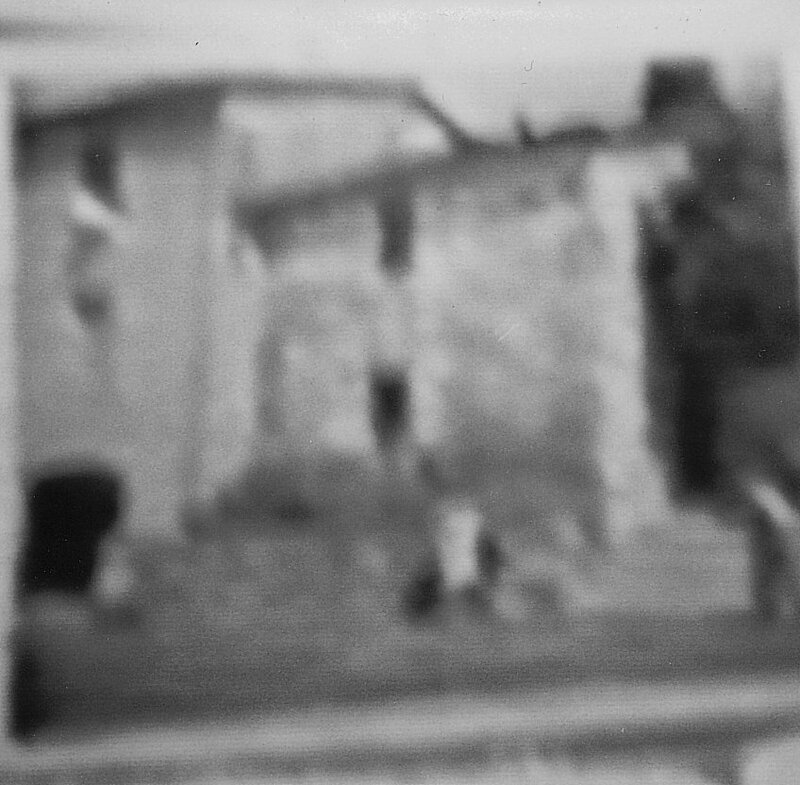 Quilietti home in Castelvecchio Pascoli. and used for the great sculptures of Italian Art. This marble has been used since ancient Roman times and the Pantheon in Rome was built from it. Michaelangelo’s famous sculpture ‘David’ was carved from one single block of the marble. Even here in Scotland the statue of Robert Burns, Scotland’s National Bard, which is situated in the centre of the town of Dumfries in Ayrshire is carved from it by Italian craftsmen who were working in Scotland in the 1880s. The statue was unveiled in 1882. 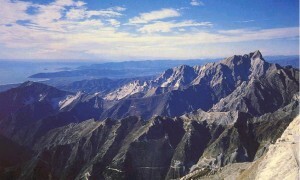 The Mountains circle the whole region and eagles are always present on these high slopes. 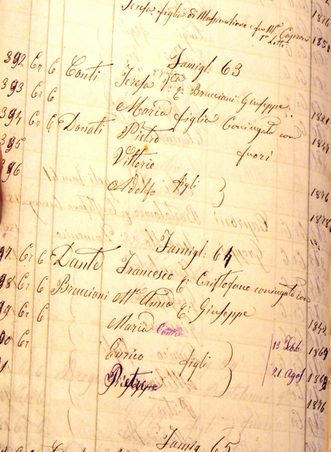 The Villa still holds a carefully conserved collection of his manuscripts, diplomas and books. 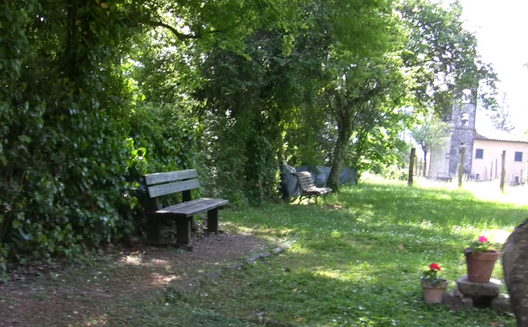 There is also a tree in the garden which was planted by the poet 100 years ago. There is also a small column and here lies the remains of his small dog Guli, In 2006 there was a n official gathering to celebrate the life of the poet and there were many new trees planted at the side of the Church to celebrate his life. 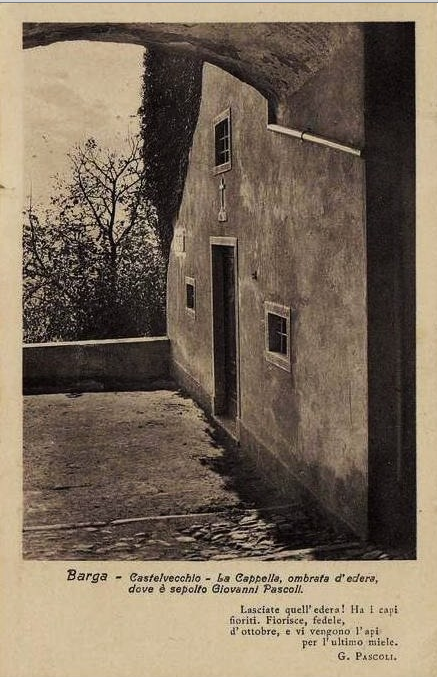 Giovanni Pascoli, born in 1855 in San Mauro di Romagna, following events that shook his childhood (his father’s death, then the mother and other family), influenced his poetry, tried to be an ideal time for themselves, where to retire.In 1895, he chose the country house of Cardosi Carrara, who was in Castelvecchio. Pastures brought with him his sister Mary. Castelvecchio the poet spent the most peaceful years of its existence, from 1895 to 1912 (his death). In this house were made: the First Poems (1897), Myricae (1903), Canti di Castelvecchio (1903) and convivial Poems (1904). 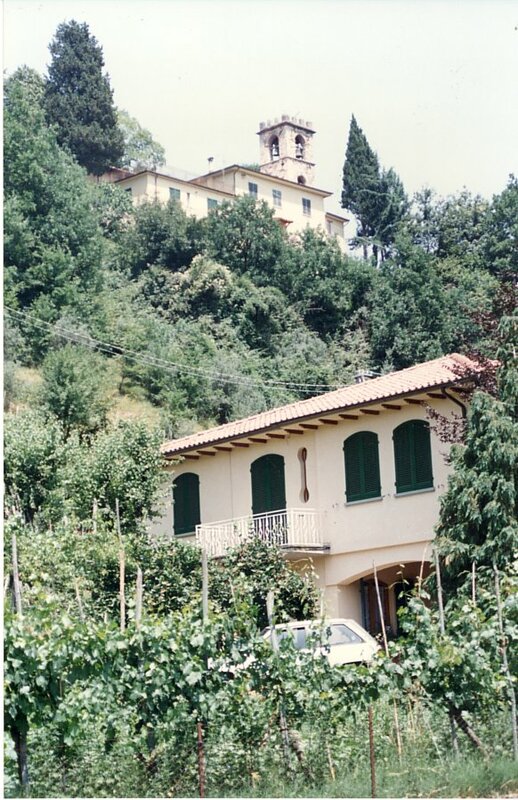 The house, even today, retains the structure, furnishings and layout of the space it had at the time of death of Giovanni Pascoli. His sister, faithful guardian of the property Pascoli for forty years, is now buried next to his brother in the chapel of the villa. 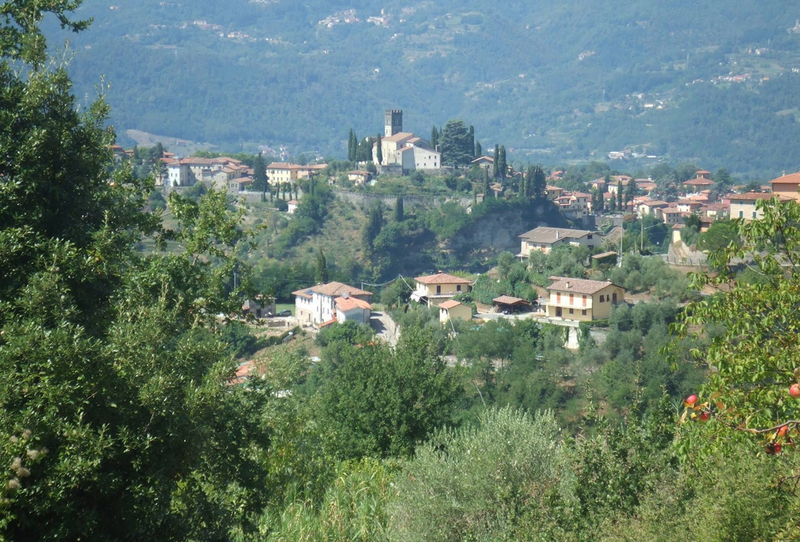 It ‘was the same Mary bequeath to the town of Barga all assets of his brother, the care of the archive ( it conserves 76mila cards), the library (which contains about 12 thousand volumes), works and buildings that comprise the house now a national monument. 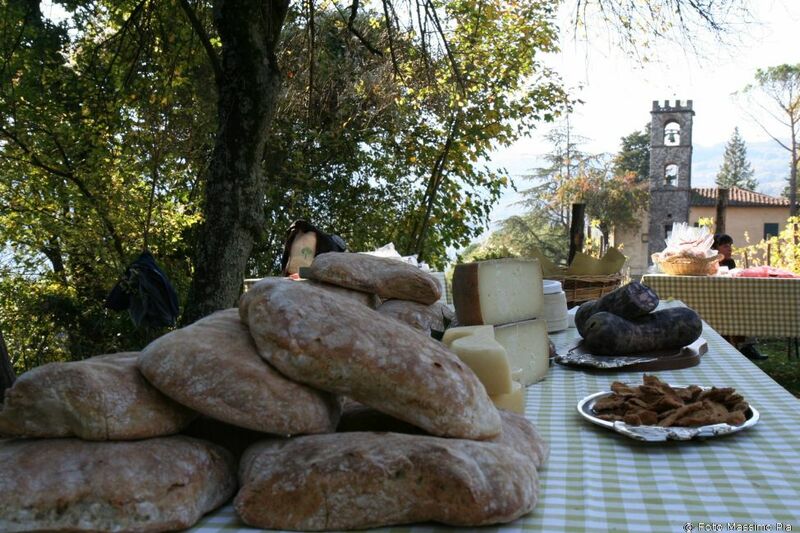 On August 10 of each year, the villa is held the evening of Castelvecchio Pascoli, with readings of poetry and prose interspersed with classical music. 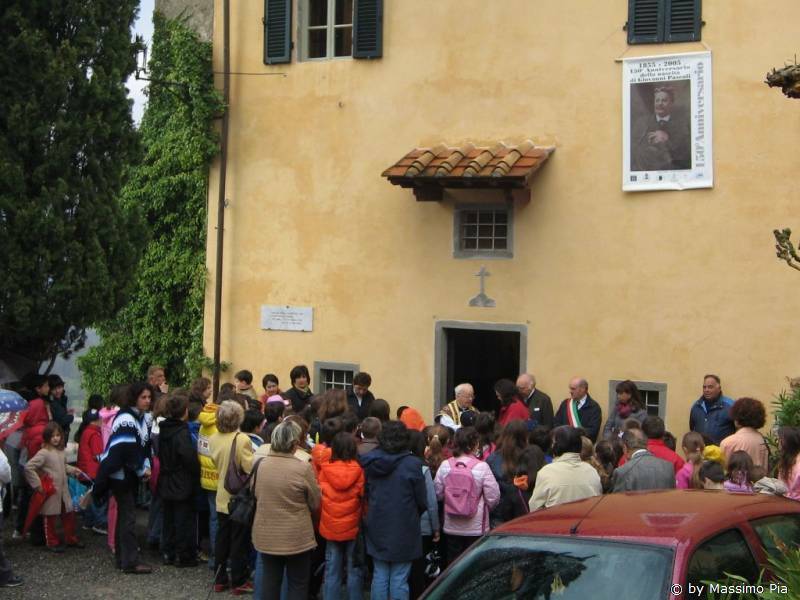 The villagers had a wonderful event that year with celebrations and a mass. There was local wines and food plentiful for all. 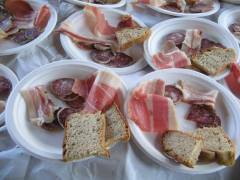 The region is famed for its farra grain, the grain of the ancient Roman Legions. 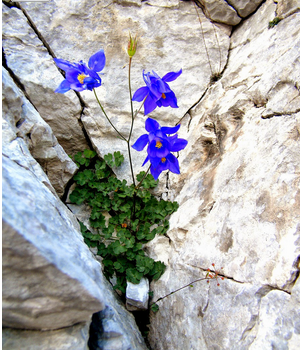 From ‘Early poems’ (1897-1907) There is something new under the sun, even in old I live elsewhere, and I feel that they are born around the violets. Son born in the wilderness of the convent of the Capuchins, between the death leaves it to the stump of oak shake the wind. It exudes a gentle air that dissolves the hard clods, and visit the churches in the country, have ch’erbose thresholds: an air of another place and in another month and d ‘ other life: an air celestina that can withstand many white wings suspended … yes, the kites! This is a morning that there is no school. We went out row between the hedges of blackberries and albaspina. hedges were bare, steep, but there was still some autumn bouquet redberries, and some fine spring white, and on the bare branches Robin jumped, lizard and the little head showed the leaves of bitter pit. Now we are stuck: we face in Urbino windy sends everyone from a cliff to his comet the sky blue. sways And here, teetering, hits, Emboss, back, takes the wind slowly here in a long scream of children s’inalza. S’inalza, and stealing the wire from the hand, like a flower that escape of the stem slender, and go away rifiorir.S’inalza, and feet trembling and I yearn for the chest of the child and the avid pupil and the face and the heart, brings everything in the sky. Higher, more about: even as a shining point there there …But here’s a breath of bias, here is a scream high … – Who screams? They are the voices of the dormitory mine know them all of a sudden, a sweet, a sharp, a veiled … One by one we perceive, all, or my friends! and you, yes, that abandonment of the humerus mute the pallor of his face. Yes, I said the prayers over you, and wept: and yet, you happy that the wind did not see that falling kites! You were all white, I recall. had only the red in my knees, for that we pray on the floor. Oh! you happy that you closed your eyespersuaded, holding you in the heart of your loved ones the most expensive toys! Oh! gently, I know very well, you will die clutching his childhood to his chest, like a white flower petals in bowl again!OR dead boy, I soon come under the turf where you sleep calmly and insole … Better come panting, pink, spring of sweat, as after a joyous race to race up a hill! Better to go with the blond head, then lay on the pillow and cold, you combed co ‘beautiful hair wave your mother … slowly, so as not to hurt you.http://it.wikipedia.org/wiki/Giovanni ..